KATOWICE, Poland — U.N. Secretary-General Antonio Guterres opened the climate summit in Poland by issuing a dramatic appeal to world leaders Monday to take the threat of global warming seriously and to act boldly to avert a catastrophic rise in temperatures before the end of the century. 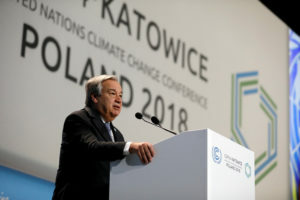 “Even as we witness devastating climate impacts causing havoc across the world, we are still not doing enough, nor moving fast enough, to prevent irreversible and catastrophic climate disruption,” Guterres told delegates from almost 200 countries who gathered in Katowice, Poland. The U.N. chief chided countries, particularly those most responsible for greenhouse gas emissions, for failing to do enough to meet the goals of the 2015 Paris climate accord, which set a goal of keeping global warming well below 2 degrees Celsius (3.6 degrees Fahrenheit) — ideally 1.5 degrees C (2.7 degrees F) — by the end of the century. Such a move, which experts say is the only way to achieve the 1.5-degree goal, would require a radical overhaul of the global economy and a move away from using fossil fuels. In order to steer businesses and consumers away from heavily polluting forms of energy, the U.N. chief urged countries to embrace carbon pricing, something few countries have yet to do. Guterres also urged negotiators not to forget that the challenges they face pale in comparison to the difficulties climate change is already causing millions around the world whose homes and livelihoods are at risk from rising sea levels, drought and more powerful storms. The two-week conference, in Poland’s southern coal mining region of Silesia, is expected to work out how governments can report on their efforts to reduce greenhouse gas emissions and keep global warming within the Paris accord limit. He later told reporters that realities about global climate are “worse than expected, but the political will is relatively faded after Paris” and is not matching the challenges. Famed British naturalist Sir David Attenborough warned the gathering that the “collapse of our civilizations and the extinction of much of the natural world is on the horizons” if no urgent action is taking against global warming. Duda, the Polish leader, said participants at the conference have backed its proposal of a “just transition” away from coal mining, which calls for helping those people, like coal miners, who are slated to lose their jobs as the world changes its energy mix.